Syria�s Permanent Representative at the UN Dr. Bashar al-Jaafari said on Tuesday that there are certain Western states that are using their �black flags and White Helmets� to stage new chemical incidents in order to obstruct the political process and justify their aggression against Syria. 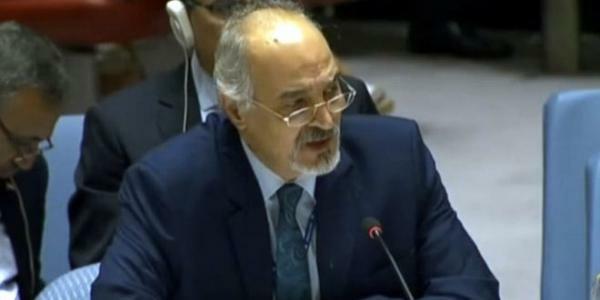 During a Security Council session on the situation in Syria, al-Jaafari said that Syria has repeatedly affirmed that it considers the use of chemical weapons immoral and that it denounces their use, reiterating that Syria does not possess any chemical weapons as it has fulfilled its obligations to the Organization for the Prohibition of Chemical Weapons (OPCW). He asserted that Syria�s chemical arsenal was destroyed on board an American ship in the Mediterranean, all while Israel�s nuclear, chemical, and biological arsenal is waiting for the �blessing of the Council.� Al-Jaafari said that Jabhat al-Nusra terrorists and groups affiliated with it are preparing to use chemical weapons against civilians in Idleb in order to accuse the Syrian forces and justify any military aggression that could be waged by the governments of the states that control these terror groups. He asserted that any aggression against Syria would constitute an aggression against regional and international peace and security, and that such an aggression would provide support for terrorism and undermine the efforts to combat it. Meanwhile, Russia�s Permanent Representative at the UN Vasily Nebenzya said that Jabhat al-Nusra terror organization and groups affiliated to it are holding thousands of civilians in Idleb hostage and preventing them from leaving. He said that members of the �White Helmets� have transported two toxic gas containers in Idleb province with the intent of using them against civilians in order to justify a US aggression on Syria. Nebenzya also asserted that the illegal presence of the US forces in al-Tanf area violates Syria�s sovereignty. Responding to representatives of some member states, al-Jaafari said that Syria has accepted 2700 requests from World Food Program to deliver aid to the liberated regions. �The Syrian Arab Red Crescent continuously cooperates with local and international humanitarian partners to deliver the aid and send tens of convoys to the needy areas,� he added.